April 2019 update: This review was originally published late in 2018. Since then the P30 Pro has arrived on scene, offering plenty of great updates to what was already an exceptional device. While the P20 Pro is still a great choice – especially if you get can it at a discount – be sure to check out our review of the latest P30 Pro! 40MP, the world’s first triple camera, 5X Hybrid Zoom, artificial intelligence in all the ways, and the most unique color on any smartphone ever. These are just some of the features Huawei is hoping will make you check out its new flagship, the Huawei P20 Pro. This isn’t the first 40MP smartphone — Nokia had the 808 PureView and Lumia 1020 in 2012 and 2013, respectively — but this is the first time we’ve seen such numbers on an Android smartphone. We crowned last year’s Huawei flagship Mate 10 Pro as the best smartphone of 2017, but does the Huawei P20 Pro pick up where its sibling left off? With the standards set by smartphones like the Samsung Galaxy S9 Plus and Google Pixel 2 XL, Huawei has a fight on its hands. Let’s find out how it stacks up in our full Huawei P20 Pro review. Kris and I have both been using the Huawei P20 Pro for about two weeks since the phone was announced in Paris. The software is still in beta, and we’re running build number 8.1.0.106 (SP9C432), with the 1 March 2018 security patch. Above you’ll find the video review, where Kris mostly focuses on the camera, while in this written review, I’ve also expanded on other areas of the phone. Although we do have the Huawei P20 as well, this review focuses on the flagship Hauwei P20 Pro, and references parts of the P20 experience where applicable. The Huawei P20 Pro borrows several design cues from the iPhone X, with a vertical camera placement on the back and notch atop the screen. It stands out with three cameras and the unique twilight color, which awakens everyone’s inner wish for a real-life unicorn. Whatever your palate, Huawei has a P20 color for you. There are four or five colors depending on which model you choose, with the regular P20 coming in a champagne gold color that’s not available with the Pro. 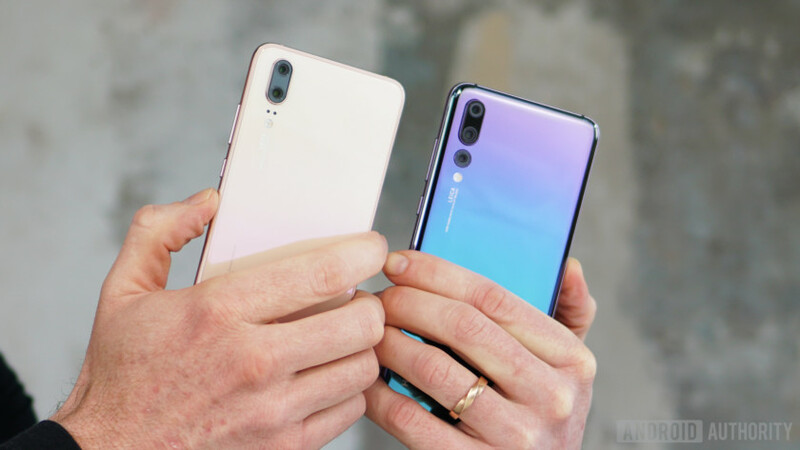 For the P20 Pro, Huawei offers black, a majestic midnight blue, and pink gold. The twilight color offers a new kind of color gradient — it actually shimmers in the light. The pink gold version also has a gradient, but its range is much more muted. Whatever your palate, Huawei probably has a P20 color for you. Beneath the screen is Huawei’s fingerprint sensor, which is flat, wide, and allows you to unlock your phone while it’s laying face up on a table. I’m normally a bigger fan of Huawei’s rear-mounted fingerprint sensors thanks to their added support for summoning the notification shade, but the P20 Pro’s scanner is still fast and reliable and supports gesture controls for navigation. The power and volume keys on the right offer nice feedback and the power button has a nice accent color. The bottom houses a speaker, microphone, and USB Type-C port. There’s no headphone jack, but an adapter comes in the box. I’m not an audiophile so I usually pick convenience over function, so I’m fine with Bluetooth audio. It’s the easiest solution and the Huawei P20 Pro works well enough in this regard. The back of the Huawei P20 Pro in twilight is stunning. It’s my favorite smartphone color ever. Despite that, the glass back feels fragile, and I kept mine inside Huawei’s official black rubber silicon case — hiding the glorious color. The camera bump at the top left has a lot of sensors, though it hides them well. The laser for the autofocus is hidden inside the black bit in the middle of the main camera module. The flash also contains a color temperature module. It’s a clever design from Huawei, and gives the appearance of things happening by magic, which fits with how AI comes into play throughout the phone. The Huawei P20 Pro brings a different design language to previous P-series devices, which isn’t necessarily a bad thing. It looks stunning, feels great in the hand and helps the phone establish an identity of its own. The Huawei P20 Pro offers a 6.1-inch AMOLED display with a rather awkward 18.7:9 aspect ratio. That extra 0.7 is due to the notch. Let’s get this out of the way: I’ve used the iPhone X for months and after a while, the notch just doesn’t matter. More phones are adopting the notch design, and you’ll have to get used to it eventually. If you really hate it, you can also turn it off on the P20 Pro, rounding the corners and turning off the extra pixels for a more standard-looking experience. The P20 Pro’s got a great panel, offering the vibrant blacks and deep colors all AMOLED panels do. The biggest issue for me is the resolution. Like with the Mate 10 Pro, Huawei opted for a Full HD+ panel. Huawei CBG CEO Richard Yu has told us several times the company chooses Full HD+ over Quad HD+ due to battery life concerns, but there’s likely another reason. Considering how the Mate 10 Pro also had a Full HD+ display, it seems Huawei saves a few features for its luxury flagship. On top of the better fingerprint sensor position, the Mate RS has a Quad HD+ AMOLED panel. We put the Huawei P20 Pro through its paces in our testing lab and it’s bright — very bright. Its top brightness of 600 nits under bright lights bests the Galaxy S9 by 26 percent, which achieves just 475 nits. Most surprising, the LCD display on the P20 is actually 23 percent brighter than its Pro counterpart, albeit with a cooler display. The Huawei P20 Pro achieves a color temperature of 7,212 Kelvin. The P20 is 9 percent cooler at 7,841 Kelvin. After testing Samsung’s latest flagships, we found Huawei’s displays are set to be about 200K warmer than the Galaxy S9s. Samsung is known for having the best displays, but the AMOLED panel on the P20 Pro is up there as one of the best on a smartphone. It’s a pleasure to use and ticks all the right boxes. The eye comfort mode works really well. Despite only being a Full HD+ display, it’s fantastic for anything you throw at it. As always, there’s a bevy of color-tuning options in the settings if you don’t like the look out of the box. The P20 Pro is packed full of the hardware we’ve come to expect from a flagship Huawei device. It’s powered by HiSilicon’s Kirin 970 chipset and, like the Mate 10 Pro, has a lot of AI features thanks to the built-in NPU. It’s backed by 6GB of RAM and 128GB of storage, alongside the Mali-G72 MP12 which handles most tasks well. The GPU isn’t quite on par with the Adreno 630 in the Snapdragon 845 on the Galaxy S9, but it held its own in our Huawei P20 Pro review testing. The regular P20 drops the RAM to 4GB, which doesn’t have too much effect on performance, at least according to the benchmark scores. The P20 Pro beats the best flagships of 2017, including the Mate 10 Pro and OnePlus 5T, but the Galaxy S9 produces results from another world. A large part of this is likely to be the Snapdragon 845 CPU, as the Galaxy S9 results are on par with our initial testing on Qualcomm’s latest processor. The P20 Pro’s benchmark performance is great right now, but it’ll likely be bested many times in the coming months. A lot of devices are going to launch with the Snapdragon 845, so we’ll have to wait until Huawei’s next Mate device to see how good its 2018 performance can get. These benchmarks show how good the performance of the Snapdragon 845 is. Like our initial benchmark scores, the Snapdragon 845 sets a new standard for AnTuTu performance. The Kirin 970 inside the P20 Pro is significantly better than the same processor inside the Mate 10 Pro (which scored 178466), but as a generation older, the Kirin 970 can’t keep up with the Snapdragon 845. These two benchmarks show that while there is a gap between the performance scores of the Snapdragon 845 and the Kirin 970, it’s a smaller difference than it has been in previous years. In particular, the Mali G72 GPU inside the Kirin 970 is close to the performance of Qualcomm’s Adreno 630 GPU, and this is reflected in actual usage of both devices. In day-to-day usage, the P20 Pro never misses a beat. The phone is fast regardless of what you throw at it. 6GB of RAM usually results in about 2.5GB to 3.5GB of free RAM at any given time. I’ve yet to see the phone stutter at all, even with a lot of apps running in the background. Huawei claims the AI allows it to remain fast over a longer period compared to other flagships, but we’ll need a longer time with the P20 Pro to confirm if this is true. Porsche Design Mate RS… in red! The P20 Pro doesn’t have expandable storage. If 128GB isn’t enough for you, Huawei hopes you’ll spring for the Porsche Design Mate RS, which comes in 256GB and 512GB variants. The P20 Pro is IP67 certified, offering dust and water resistance up to 1 meter for 30 minutes. The regular P20 is only IP5X rated, so it’s splash proof, but doesn’t offer anywhere near the same level of durability and protection. There’s no headphone jack, which may be a deal breaker for some users, but personally, I don’t mind. The phone comes with USB Type-C headphones in the box, which offer crisp sound but are otherwise unremarkable. There’s also a USB Type-C to 3.5mm adapter so you can use your existing headphones. If wireless headphones are more your preference, like me, there’s support for Sony’s LDAC codec and HWA 990 Kbps high-res audio over Bluetooth 4.2. There are also stereo speakers with Dolby Atmos support. These speakers are pretty good, and deliver loud volume without too much distortion. I find them a little louder than the Galaxy S9, though Huawei’s silicon case muffles audio a little. Dolby Atmos is a useful addition and offers a stereo-like effect during audio playback. Like other Huawei phones, the P20 Pro comes in dual-SIM flavor. Dual-SIM functionality isn’t new to most smartphone ranges, and even the Galaxy S9+ has an optional dual-SIM variant. Unlike most others, you don’t need to get a different variant of the P20 Pro to get two SIM card slots. When you do have two SIM cards in play, both can access 4G LTE, and you can customize which is used for data and for calling. Like previous Huawei devices, the P20 Pro allows you to disable the on-screen keys and use gestures on the fingerprint sensor to navigate if you prefer. A tap on the sensor takes you back a screen. Pressing and holding takes you straight to the home screen. A horizontal swipe launches the recent apps overview. Personally, I don’t like this and have stuck with the on-screen keys. 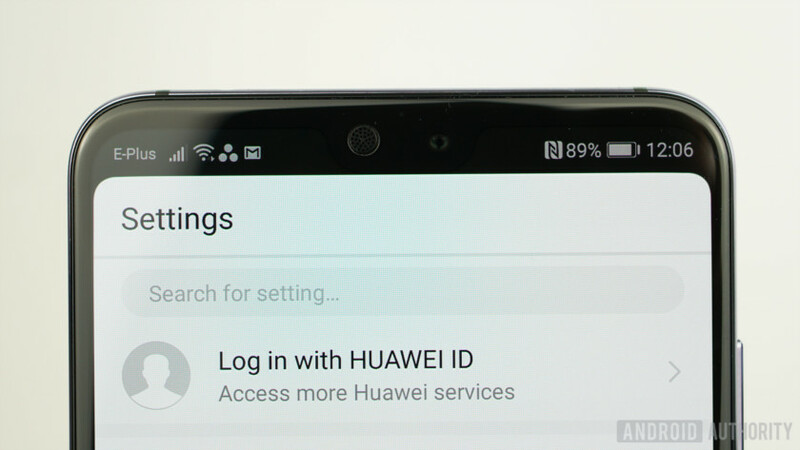 Huawei backs up the fingerprint sensor with its face unlock feature. It’s not as secure as Apple’s Face ID, so it can’t be used for payments and other secure transactions, but it’s lightning fast. In almost any condition, including pitch black, it unlocks your phone so fast that you don’t even see the lock screen. We tested it in the back of a moving taxi, in a dark room with little to no light, and in day-to-day usage, and it’s the best way to unlock your P20 Pro most of the time, assuming you’re OK with the heightened security risk. With direct sunlight behind you, however, the face unlock doesn’t work — just like Face ID on the iPhone X. The P20 Pro has one major advantage over other 2018 flagships up its sleeve — a 4,000mAh battery. Most flagship devices come equipped with a battery ranging from 3,000 to 3,5000mAh battery. The P20 Pro brings the same battery capacity as the Mate 10 Pro, which we crowned as the best smartphone for battery life last year. It’s great to see a company not conform to battery capacity norms. A large battery combined with Full HD+ resolution results in exceptional battery life on the Huawei P20 Pro. The battery life on the P20 Pro doesn’t disappoint. During nearly two weeks with the device for our Huawei P20 Pro review, the battery lasted around two days on average, with around six to seven hours of screen-on time. During my flight back to San Francisco from the launch event in Paris, I used the phone as my Kindle device and reached San Francisco with over 50 percent battery left, after over 9 hours of solid screen-on time. Our Huawei P20 Pro review testing numbers also reveal a similar story. Overall, the P20 Pro offers better battery life than any other device we’ve tested, including the Mate 10 Pro. Our Wi-Fi browsing test cycles the same set of webpages and drains the battery from 100 percent to 0 percent, with the display set at 200 nits brightness. The P20 Pro lasted 11 hours and 28 minutes, which is better than the P20 at 10 hours and 17 minutes, but not as good as the Mate 10 Pro which lasts for 13 hours straight. In our video playback test — where we loop a 1080p video at 200 nits brightness — the P20 Pro lasted 12 hours and 21 minutes, while the regular P20 lasted for 10 hours and 20 minutes. The P20 Pro proves to be much better than the Mate 10 Pro and Galaxy S9 Plus here, which lasted for 10 hours and 40 minutes and 11 hours and 16 minutes, respectively. Interestingly, last year’s LG V30 also proves to be a champion here, lasting for 12 hours and 20 minutes. Samsung phones are known for offering a ton of features, but battery life has always been a concern. The P20 Pro offers 11 percent more average battery life than the Galaxy S9 Plus, which is actually less than we expected, given the 12 percent larger battery and lower resolution display. Huawei has improved battery life with updates in the past, though — the Mate 10 Pro battery life got significantly better after its first update — so we’d expect the Huawei P20 Pro battery to improve with age. Overall, the battery life is arguably the best we’ve seen from a flagship smartphone to-date. Whatever the task, the battery will easily last you a full day or two. For many users, it’ll last much longer. During our time with the Huawei P20 Pro, using the camera didn’t seem to have too large an effect on the battery as we spent three hours shooting with the phone in Paris with the display at full brightness and the battery only drained 18 percent. The P20 Pro comes equipped with Huawei SuperCharge, which charges your phone to full in just 90 minutes. The P20 also has SuperCharge and is even more impressive, charging to full in just 72 minutes — faster than any smartphone we’ve tested. In 30 minutes, the P20 Pro charges to 54 percent, while the regular P20 charges to 65 percent. In 60 minutes, they charge to 87 percent and 95 percent respectively. By comparison, the Galaxy S9 Plus and S9 take 96 and 93 minutes respectively, despite both having 500mAh-smaller batteries than their P20 counterparts. They say big numbers help sell phones. If that’s the case, Huawei has plenty of these to lean on in the P20 Pro’s camera. There’s the world’s first triple camera, a 40MP main sensor, 3X Optical Zoom, 5X Hybrid Zoom, 4D Predictive Focus, 102,400 maximum ISO, 2μm pixel size, 4-in-1 Hybrid Focus system, 960 frames per second slow-motion recording, and more. The camera also has Huawei’s new AI-assisted stabilization (AIS), which lets the P20 Pro take long-exposure shots without a tripod. The three cameras combine to make an incredible trio that produce great shots in all conditions. Each camera serves a different purpose. The main 40MP sensor captures rich color, the 20MP secondary monochrome sensor captures additional details, and the third 8MP telephoto lens is used for zoom and additional focal length. They make for an incredible trio which produces great shots in all conditions. Kris goes into more depth on the make-up of the camera in the video review, and Adam has rounded up all the facts on Huawei’s triple camera in our walkthrough below. The 40MP main sensor will be a draw for many users. I remember working retail when the Nokia 1020 was launched. I experienced first-hand how many customers came into the store asking for the phone with the 40MP camera. The P20 Pro’s camera will likely have the same effect for Huawei, at least outside the U.S. where it will appear on store shelves, but without the turn-off of Windows phone OS. By default, the camera shoots images at 10MP, which is where the 2μm pixel size kicks in. The main camera actually has 1μm pixels, but by default, the P20 uses a process called pixel binning to combine the light information from four 1μm pixels into a larger 2μm super pixel. You can shoot at 40MP if you want, but remember, the smaller 1μm pixels are less sensitive to light, and you can’t zoom in, so you’ll only want to shoot at full-res in well-lit conditions where zooming isn’t necessary. By using pixel binning rather than just having 2μm pixels in the first place, the 40MP camera offers more versatility. As a result, you can take rich 40MP photos in great lighting, and still get excellent low light performance when lighting conditions aren’t as good. The 20MP monochrome lens also has a part to play in the overall pictures, as it captures three times as much light information than the RGB sensor (because it has no color filters). The result is images with more detail, increased sensitivity to light and less noise in shadows. The P20 Pro combines the data from both sensors to capture vibrant, richly colored and nicely detailed pictures, regardless of the lighting conditions. The third lens really sets the P20 Pro apart from other smartphones. It offers 3X optical zoom and captures about a ninth of the standard frame (so if you have the grid overlay on, you’ll always know what you’ll get at 3x). In darker conditions, the smaller f/2.4 aperture results in less light sensitivity though, so even when you’re zoomed in, the P20 Pro is still using all three cameras. Just cover the telephoto lens at 3x zoom to see it in action. There’s also a noticeable shift in the colors when switching between 1x and 3x zoom. The P20 Pro also brings the world’s first 5X Hybrid Zoom, which combines the 3X Optical Zoom with additional detail from the main sensor to achieve a 5X Hybrid Lossless zoom. It’s fantastic. From graffiti on buildings in Paris to bottles of wine in a restaurant’s wine rack, the Hybrid zoom is a lot of fun to use. I’ve spent many moments zooming into pictures, and even when pixel peeping, the result is excellent. 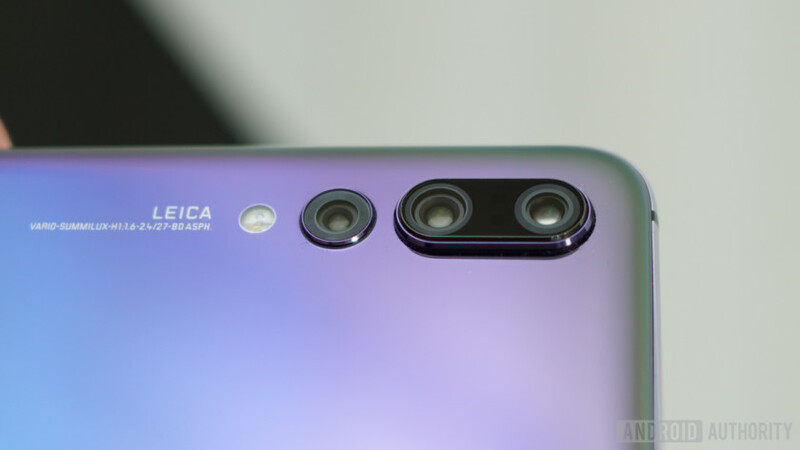 Many companies have claimed lossless or hybrid zoom in the past, but the P20 Pro seems to be one of the first devices to actually deliver on this feature. The 5x images naturally aren’t as good as they would have been with 5X optical zoom, but they are very similar to the level of detail from the 3x. As Kris says, it’s nice to know you can digitally zoom in a bit and still maintain image quality. The P20 Pro lets you zoom in up to 10x digitally, but we wouldn’t recommend going past 5x if you still want crisp detail. The telephoto lens is the only one that officially comes with OIS, but an iFixit teardown seems to show OIS in all three lenses. Regardless, the P20 Pro also uses AIS across the board. It analyzes the frame and ditches small parts of the edges to keep everything stabilized. 4D focus also predicts where a subject is moving and keeps it in focus, so you have smooth overall footage with locked-on focus. To see how AIS compares to EIS used on the Pixel 2, check out the video review above. AIS is responsible for what both Kris and I think is the biggest highlight on the P20 Pro camera: night mode. If you’ve tried to shoot a low-light, long-exposure shot by hand, you’ll know the resulting image is usually full of noise and image shake. AIS solves this by stabilizing the image long enough for you to capture a four-second handheld long exposure at night that’s crisp and blur-free. Add in the excellent low-light sensitivity and detail of all the sensors combined, and the results are simply amazing. On the P20 Pro display, all these images look fantastic. It’s only when you begin pixel peeping on your computer that you start to see where the P20 Pro falls down. As Kris mentions in the video, however, this raises an important question: what constitutes a good photo? Is it the one that produces the most realistic colors, or the one that makes them pop the most? Is it the one that maintains detail at the expense of added noise, like the Pixel 2, or the one that looks great on your phone but like a painting up close? Your answer will determine if the P20 Pro is the camera for you. If you want true-to-life images with more detail when you zoom in, the Pixel 2 is the better camera for you. But if you want images that look the best before you start crawling the pixels, the kind that will look better on social media, then the P20 Pro might be for you. The P20 Pro’s 24MP selfie camera is definitely an example of more megapixels not really translating to better photos. Millions of pixels aren’t much good if the photo captured is soft. Even with all of Huawei’s effects turned off, selfies have a noticeable smoothness that shouldn’t be there. It is possible to take some good pictures with the P20 Pro’s front camera in good lighting, but the images are too soft and artificial for my tastes. With such a reflective rear panel, you’re better off just flipping the camera over and using the back as a mirror to take the perfect selfie! The front and the rear camera both have a portrait mode, but both are a little hit or miss. In our Huawei P20 Pro review testing, software-assisted bokeh couldn’t handle Kris’ wild hair (as most phones can’t). It faired a little better in my own test shots, but it’s not on par with the Pixel 2. However, the rear camera also comes with a feature only Huawei offers, which I got a lot of joy out of using on the P20 Pro and the Mate 10 Pro. Slide all the way to the left in the camera and you’ll enter aperture mode, called wide aperture mode on past Huawei devices. The P20 Pro allows you to capture images using the main sensor, and adjust the focal point and aperture size both pre- and post-capture. This isn’t a new feature — The Galaxy S9’s live focus feature does it too — but the P20 Pro’s aperture mode allows you to change the aperture from f/0.95 to f/16. Unlike the Pixel 2 and other devices which only offer one type of Portrait, the P20 Pro leaves the customization up to you. By default, it’s set to f/4 which produces a natural amount of bokeh like other devices. If you prefer more bokeh, you can change it to f/0.95. If you don’t like much or any bokeh in your photos, then the f/16 option is designed for you. Aperture mode works well for selfies, as you can adjust the amount of bokeh in the shot, and if the cutout is all wrong, remove as much background blur as possible. Similarly, if you take a great picture and decide you’d prefer to have your focal point elsewhere, you can easily change it. The P20 Pro is aided by the Kirin 970’s Neural Processing Unit (NPU), which helps with all of its AI features. These features are most apparent in the camera. Alongside the AIS which allows you to take excellent photos and video, there’s also automatic scene recognition. The scene recognition can be good, but Kris and I both found it occasionally got in the way of taking excellent pictures. Once you get to know the AI’s attitude to photography, you can take advantage of the suggestions you like and ignore those you don’t. This is because Huawei now lets you deny automatic scene recognition changes as they pop up or you can disable AI assistance entirely. Sometimes you’ll find yourself fighting with the AI, trying to take a regular shot while it keeps changing settings on you. For example, there are dedicated portrait and night modes in the camera, but the AI will automatically switch to portrait mode when it detects a human face in the frame or launch into night mode in the dark. Of course, this can be helpful, but if you don’t like fake bokeh or aren’t after a long exposure it can be annoying. One of the new scenes recognized in the P20 Pro is waterfalls, but the phone automatically tries to take a long exposure for that dreamy water effect, but this isn’t always the best way to capture it. Once you understand which scenes the phone is good at tweaking, the results can be fantastic. The AI can automatically detect food, dogs, and cats (with separate modes for each of these pets), and it can boost colors to provide a more vibrant image. Similarly, the greenery mode really makes grass pop out of an image and the blue sky mode makes even dreary skies look nicer. It’s not the most accurate look, but it’s amazing on social media, which appears to be Huawei’s goal. Personally, I liked it when it automatically switched to portrait and night mode, but Kris found it a nuisance as there are already dedicated modes for these. I also like it when it switches to greenery, food, or dog scenes. The results are usually much better for social media. The P20 Pro is the first smartphone with the ability to shoot up to 102,400 ISO. This feels like a number that’s big for the sake of being big. A photo shot at that ISO would typically have enough grain to completely ruin the image, which is probably why you can’t select anything above ISO 3,200 in Pro mode. During our briefing and the press conference, Huawei made a big deal about the P20 Pro’s 4D predictive tracking, which uses AI to predict where a moving subject is headed to maintain focus. In Huawei’s demo it worked well, and it mostly delivered in our testing. We found the autofocus struggled to stay locked on a moving subject like flowers blowing in the wind, which you can see in the video review. It’s not terrible, but it’s not as good as it was on stage either. Another big AI camera feature is assisted framing, which helps non-photographers capture images with better composition by giving them various tips based on their photos. It doesn’t seem to work right now. There doesn’t appear to be an option in the settings for it and neither Kris nor I saw it pop up on its own at all. It’s more than likely coming in a future update. We’ve reached out to Huawei and will update when we have more information. One thing that I do find a little strange about the P20 Pro camera is the location of HDR. By now, almost every smartphone offers an automatic HDR option, but Huawei insists on keeping this option hidden away in the modes menu. Night mode can act as an HDR replacement in certain shots — such as a high contrast shot with a bright light source — but it doesn’t work all the time. Instead, you need to open the HDR mode and there’s no way to make it automatic. We wish Huawei would change this. There are a lot of other features still to touch on with the camera. The Ultra Snapshot mode launches the camera in 0.3 seconds from screen-off. Unfortunately, it only captures a 7MP image in 18:9 aspect ratio and there’s no way to change this in the settings. Since the image is taken so quickly, there’s no AI scene recognition either. Fortunately, you can change the function of the button shortcut in the settings menu, which I did. The camera is plenty fast enough once you launch it, and I’d rather have more control over my images, so I changed the shortcut to launch the camera without taking an image. The Huawei P20 Pro also captures 960 frames per second slow-motion video recording like other recent flagships. It’s a fun feature to use and it’s relatively easy to get the timing right — I struggled a little at first, as it happens almost instantly when you press the capture button — but it’s not as fun as the Galaxy S9 Plus. Samsung’s flagship brings an automatic slow-motion mode, so you don’t need to perfectly time the shutter, which makes taking slow-motion video a lot more fun. Before the Huawei P20 Pro was announced, the rumors had me excited. Since the launch of the Nokia Lumia 1020, I and many others have been waiting for a replacement. Back then I wouldn’t have pegged Huawei as the company that would offer it, but the P20 Pro has the camera we’ve all been waiting for. The Huawei P20 Pro is the flagship smartphone camera we’ve all been waiting for... It features all the hardware you could want in a camera and takes stunning photos. It features all the hardware you could want and gives you the tools to take visually stunning photos. The AI features get in the way a bit, but once you learn how to make it work for you, the results are amazing. The 5X hybrid zoom is a highlight, but the night mode has me wanting to go out and take pictures just to see what it produces. You could give 40 people the same scene and they’d take 40 different pictures. The Huawei P20 Pro is designed to allow you to take the photos you want, albeit with a focus on social media, sharing, and being visually appealing on a smartphone screen rather than blown up on a computer. The versatility of the camera sets it apart from the competition and no two P20 Pro pictures are the same. Indeed, with some training on the different modes, you could give 40 people the same scene and they’d take 40 different pictures. Therein lies the problem though. While phones like the Galaxy S9 and iPhone X are designed to have no learning curve, there is one to the Huawei P20 Pro camera. If you’re not willing to invest time to truly understand it, it’s not the camera for you. If you are willing to learn how to use it, the results speak for themselves. The Huawei P20 Pro runs on Android 8.1 with Huawei’s EMUI 8.1 interface on top. Huawei’s interface has come a long way since the days of the P6, but it remains a polarizing experience — you either love it or hate it. Personally, EMUI is as functional as any other interface for me. It has some quirks, but it’s on par with any other OEM skin out there. EMUI 8.1 brings the same packed feature set from EMUI 8 on the Mate 10 Pro, with a couple of small additions. Like the Mate 10 Pro, PC Mode works with nothing but a USB Type-C to HDMI cable and works well enough. I’ve yet to see a need for using your smartphone as a PC, and my constant travels make me the type of consumer Huawei is going after. That said, if you want an easy solution to using your smartphone as a PC, the P20 Pro’s Desktop Mode does the trick. Oddly enough, the biggest new software feature on the Huawei P20 Pro is the ability to “turn off” the notch. We’ve touched on it above, but it’s a noteworthy feature that we hope comes to other Android smartphones. Huawei’s face unlock is a software-based feature for the Huawei P20 Pro that proves, at least for unlocking your smartphone, you don’t need a lot of additional hardware for a great experience. As part of EMUI 8.1, Huawei has also added six more automatically detected scenes in the camera, including fireworks, dogs, cats and waterfall. It also added NPU tricks to the album. We’ve not really been able to test this, but Huawei says it uses AI to give each photo an aesthetic score based on how pleasing it is, and displays larger thumbnails for the photos with the highest scores — all to make your gallery more appealing. The Hauwei P20 Pro also sees the launch of the Huawei AI Engine (HiAI), an open framework for developers to make use of the NPU’s AI features. In China, the company has worked with partners to add enhancements to the camera, like a vision recognition feature similar to Bixby Vision, automatic filters for photos, and a voice assistant. There are no plans to bring these features to other countries, but the engine is open to developers around the world. Polarizing though it is, EMUI offers a ton of customization options, once you dig into the features. You can add options to the navigation, make use of tons of gesture controls and knuckle shortcuts, choose how you want to navigate your phone (using gestures or the default on-screen keys), customize the status bar, and more. I like the ability to display the network speed. It’s proven helpful when trying to troubleshoot my data while roaming. There’s also an always-on display option buried in the security settings. If you’ve used a Samsung Galaxy device over the past few years, you’ll have likely experienced a similar feeling. The Samsung Experience — formerly known as TouchWiz — was polarizing at first, but with hundreds of millions of devices sold, it has become a mainstay. EMUI is somewhat similar. Personally, I have no issues with it, but chances are you already know how much of a deal breaker EMUI is for you. Huawei P20 Pro review: The Galaxy S9 killer! The Huawei P20 Pro is the company’s most ambitious smartphone to date, combining flagship features with an incredible camera. A number like 40MP is bound to get people interested, and the phone lives up to its billing as a photographic masterpiece, though it takes some getting used to, like any good DSLR. The biggest Android competitor to the Hauwei P20 Pro is the Samsung Galaxy S9 Plus, and which you should buy depends mainly upon your preferences. If you want a phone that can take great photos without having to learn too much, the Galaxy S9 Plus is the way to go. If you want a phone to take great pictures in every condition, and you’re willing to put a little time into learning the many settings and options, the Huawei P20 Pro is for you. Both devices are flagship through and through, yet they feel very different. I’ve long been a fan of Samsung’s flagships, but the company has made great devices for many generations — the S9 Plus is just the latest. It has few noteworthy features, but it’s mainly more of the same. The P20 Pro is the best Huawei smartphone ever made and is one of the best devices now. It has a sublime camera, outstanding battery life, a color unlike any other. In short, it delivers a flagship experience surpassed by none. The Huawei P20 Pro is available on Amazon in Black, Midnight Blue and Twilight colors for prices that begin at $635. What are your thoughts after reading our Huawei P20 Pro review? Is the world’s first triple camera, with its 40MP main sensor, a big deal to you? What about the unique color or the excellent battery life? Let us know in the comments below!